Services will be provided in Ukrainian. 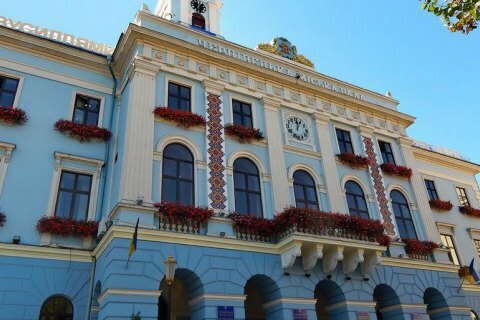 The Chernivtsi city council has adopted a decision to hoist the red-and-black flag of the Organisation of Ukrainian Nationalists (OUN). The council also made the use of the Ukrainian language mandatory in all areas of city life, according to the website of the Freedom party which initiated the decisions. The city hall and public offices will raise OUN flags on days marking important events in the history of liberation struggle. State-owned and private companies and offices are advised to follow suit. Recently, the local councils of Ternopil, Lviv and Ivano-Frankivsk regions also decided to fly OUN flags. A similar decision by the Kyiv city council is pending. According to the council's decision, all documentation, announcements, printed, audio and visual advertisements, information about goods and services must be in Ukrainian. The city councils in Lviv and Ukraine earlier to switch to Ukrainian only in the service sector.